In a joint activity with the MIRROR and the IntelLEO projects, MATURE has organized a second edition of the MATEL workshop at this year's ECTEL 2011 in Palermo, Italy. 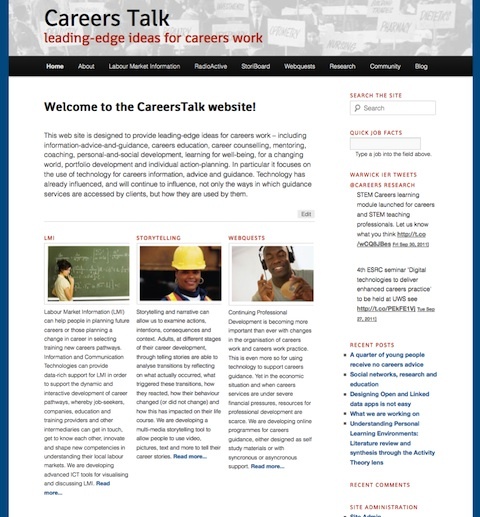 As a result of the work conducted within MATURE, Pontydysgu and the Institute for Employment Research, Warwick University, announce a new web site (CareersTalk), providing access to the ongoing research and development into careers guidance and in particular, the use of new technology to support careers guidance. Much of this work has been also supported by the G8WAY project. On September 29, 2011, MATURE has invited career guidance decision makers, researchers, and practitioners to Warwick, UK for an interactive demonstration of MATURE tools. Almost 50 participants discussed with the MATURE team on the usefulness and potential of the people tagging demonstrator, the widget-based environment for developing and sharing LMI related content, the LMI visualization tool, and learning and development modules. The participants have been very interested in using the tools, and as part of the plenary discussion, many interesting ideas for further development have come up that the MATURE team will explore further.